After Saturday’s 49-7 win against Rutgers, it is apparent that redshirt sophomore quarterback J.T. Barrett has earned his starting position within the offensive unit. Ohio State coach Urban Meyer announced last week the news of Barrett starting over redshirt junior Cardale Jones for the first time in the 2015 season. Barrett was able to take the reins in the 2014 season as the previous starter, Braxton Miller, was injured before the season even began. 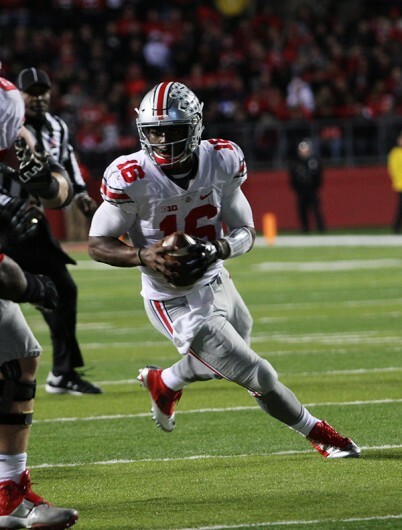 Barrett went 11-1 as the starting quarterback before he was injured with a broken ankle in the fourth quarter against Michigan on Nov. 29 while the Buckeyes led 28-21. Jones then stepped into the starting position leading the Buckeyes through three major wins, one being the National Championship. After the celebration of the team’s success had finally settled down, the two quarterbacks geared up for one of the most publicized quarterback battles in college football history. The decision to claim one starter above the other seemed inevitable to all fans, but when it came down to it, the coaches had a much tougher decision, as both Jones and Barrett have a multitude of valuable qualities that they bring to the field. Jones’ confidence on and off the field gave him the ability to lead the Buckeyes to a 10-0 record as the starting quarterback. Meanwhile, Meyer has described Barrett as a “humble perfectionist,” which is shown through his leadership, as evidenced by the fact that he was voted as a captain this season. While both quarterbacks have different attributes that allow them to shine, the decision to claim one over the other as starter just didn’t seem possible. Within the first seven games for the Buckeyes, both Jones and Barrett saw significant time, allowing both athletes to make a case for why each deserves the big spot. With the OSU offense looking in disarray, the coaching staff looked for an answer, and they found it against Penn State. It wasn’t until the “Dark Night at the ‘Shoe” that the decision was clear. Barrett went from the red zone quarterback to taking over for Jones full time in the second half. Winning 38-10 over Penn State revealed the high-powered Buckeyes we all remember from the 2014 season. After Barrett was named the starting quarterback following his performance against Penn State, the stage was set for the game against Rutgers. He proved himself more than worthy of the starting position by leading the Buckeyes to their most impressive blowout of a lesser opponent this season. Barrett led the Buckeyes to a 49-7 win in which he had 324 total yards of offense, with three passing touchdowns and two rushing touchdowns. The Buckeyes’ offense finally revealed what the defending champions’ fans have been waiting to see this season. As the Buckeyes took the field with their new starting quarterback it was as if a sense of rejuvenation, readiness and confidence had been draped upon them; the team was and now is more ready than ever before. With Barrett leading the charge, we all witnessed the best game performed by OSU thus far. Although it may be eight games into the season, the Buckeyes finally look like they have a vision in mind for a second straight championship. As the captain led the team to victory, one can conclude that, with Barrett in the starting position, the Buckeyes have a bright future ahead. I always joke with my baby buckeye alum the DMV is so glad UMD (my alma mater) joined the B1G so the sports reporters have an excuse to discuss the buckeye all d@ day and night!!! hahahaha Cardale you made me proud the talking heads could only discuss you being into the game and not acting childish because JT/Braxton didn’t when “you” took the team to the national title!! Remember NFL millions!! Urban watched you on CBS This Morning and as usual the panel did a horrible interview and went negative (concussions) like they always do. They know nothing but politics if Gayle isn’t there to keep it light and fun! hahahaha Terrible title for the book! hahaha Good luck buckeyes! I like how the playoff system has made teams step up (no automatics)! Ok, so now that there is some order and consistency at QB, and it appears some viable communication between the offensive play calling and execution; how about working on getting the TE’s into the receiver corp going forward ? These should be clutch passes to big targets going forward. They are practically non existent so far this year – albeit good blocking and decoys, but they were recruited with great talent to catch and rumble. GO BUCKS !